Hey guys, it’s time again for Themed Furniture Makeover Day with my creative blogging friends. Every month we have a new theme (you can see all the past ones HERE) and this time we’re sharing anything related to the Outdoors. I decided to update this yard sale dresser I got earlier this summer. It had nicks and scratches all over and burn marks on top from a curling iron. This post contains some affiliate links, at no extra cost to you, to help you easily find some of my favorite products to use. First things first, I gave it a good sanding all over the blemishes and burn marks to smooth everything out. I patched the nicks with Minwax Stainable Wood Filler. Then I primed with Zinsser Bulls Eye 1-2-3 Primer to avoid bleed-through (two coats in some areas!). After all the prep work, it was time to have some fun! 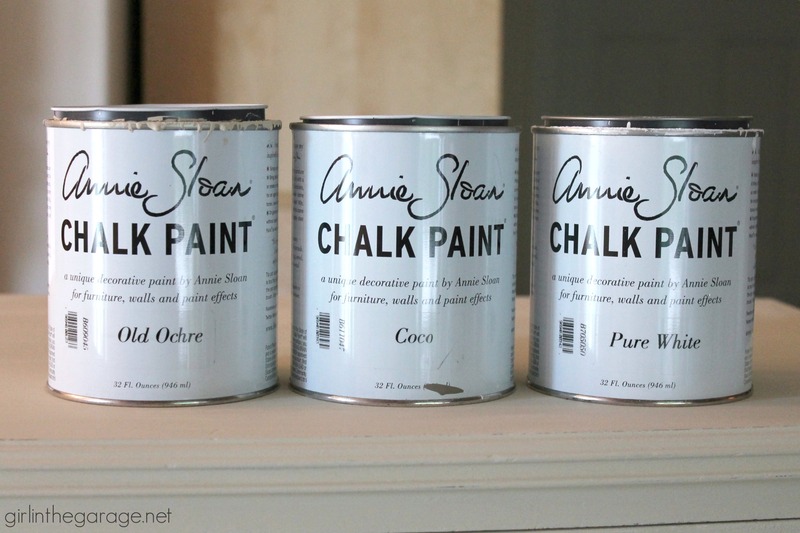 I painted the dresser in Annie Sloan’s Chalk Paint in Old Ochre. I debated on changing the pulls, but since there are ten of them that would’ve added at least another $20-30 to the cost, so I painted them too. 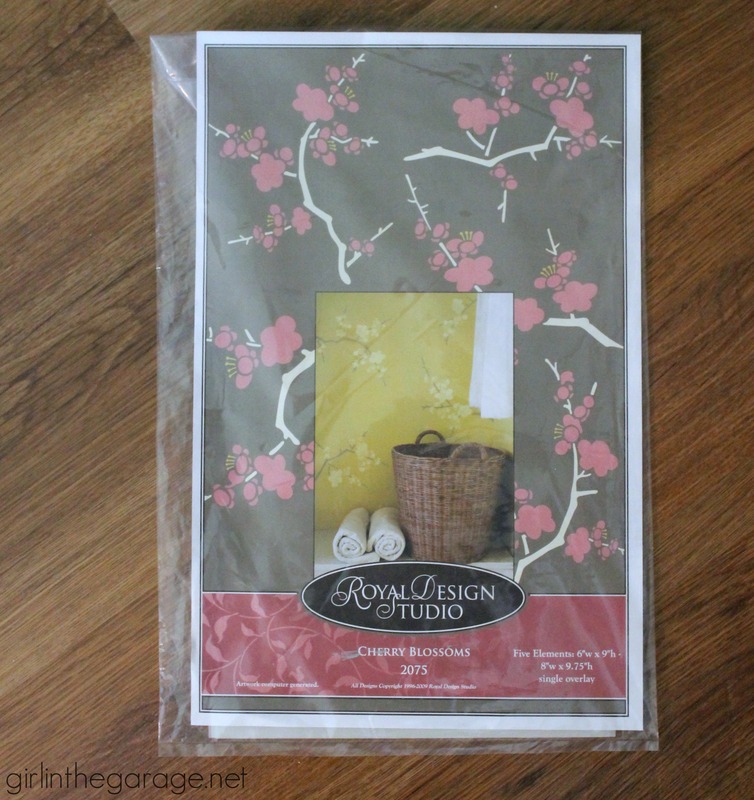 I laid out the stencil sheets with FrogTape Delicate Surface Tape, and painted them with Annie Sloan’s Coco and Pure White. I went back through and connected the branch segments with a small paintbrush so it doesn’t look so separated. And I’m glad I went with the two-tone stencil colors this time – it really makes the design pop even more. 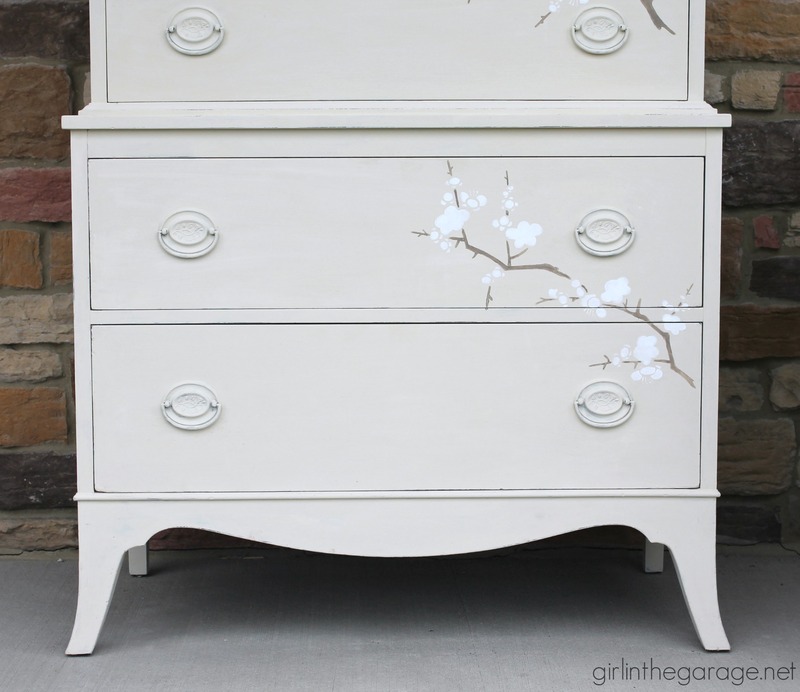 I didn’t paint all of the drawers – just the front panel and top lip on each. And I’m happy with how the handles turned out. It’s great to keep costs down, especially when you’re planning on reselling your furniture. 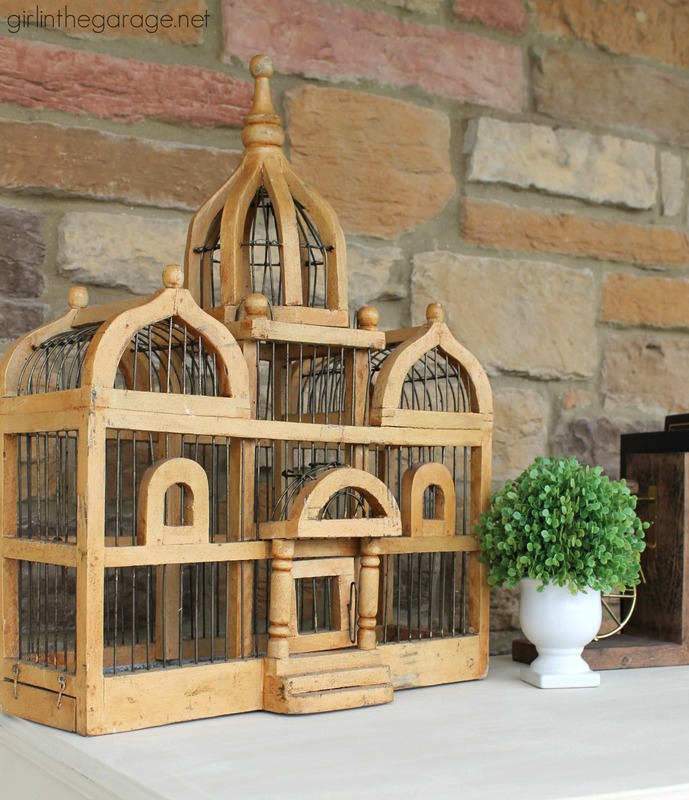 I got lucky a few weeks back and found this vintage birdhouse at the thrift store. I thought about painting it but I kind of love the caramel wood color! 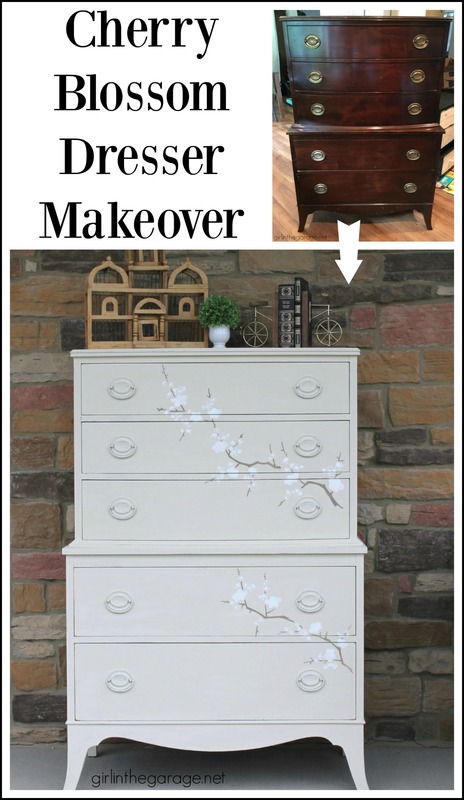 What do you think of my dresser makeover? 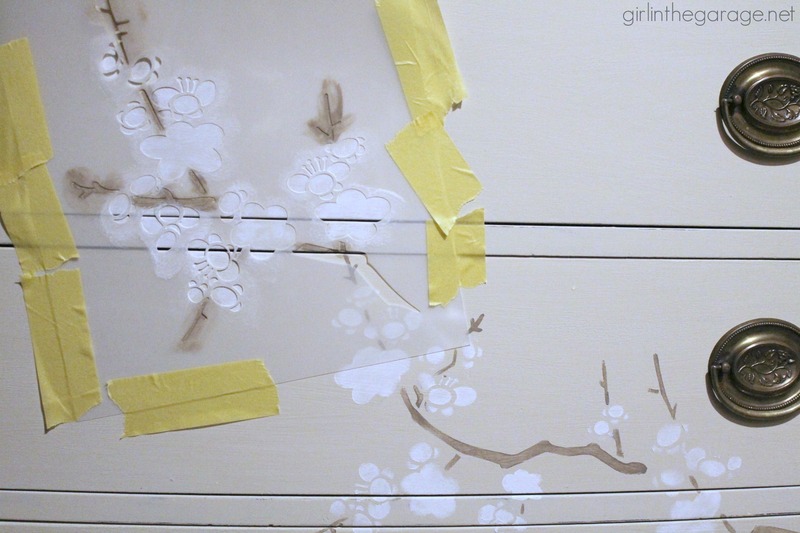 I love the Cherry Blossom stencil and it’s helped me makeover two of my favorite stenciled pieces! Now it’s time to see what my friends have been up to… Click the photos below to learn all about their “Outdoors” themed furniture makeovers. I love this, Jen! So light and pretty! It will sell in a heartbeat! Oh my Jen, it’s beautiful! Love the soft colors you paired together. 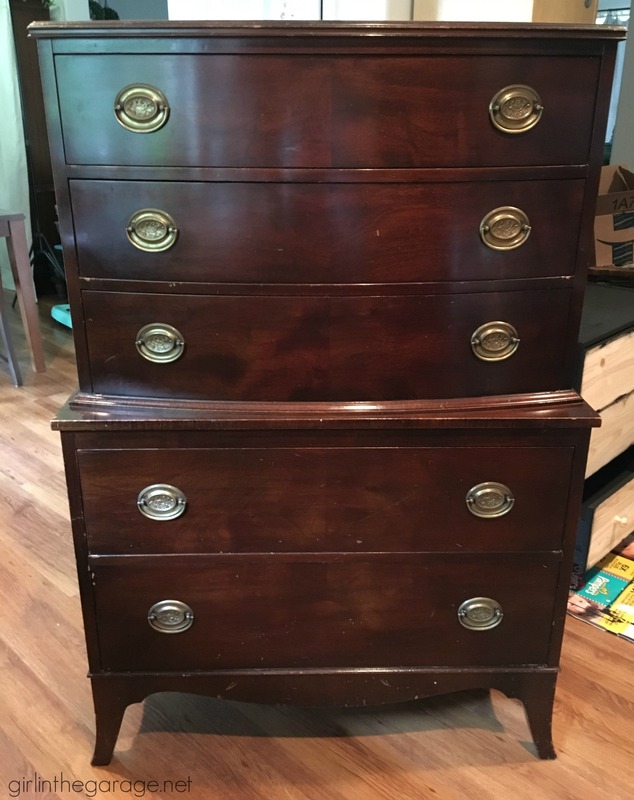 I suspect this dresser is going to be a quick seller for you. You rocked the stencil, girl! That stencil may just be my favorite yet. Jen, this makeover is stunning! Beautiful! You knocked it out of the park. The colors are so soft and calming! I love it! I absolutely positively love it. And I have to tell you those are my favorite handles. I purchased some for a desk I re-did. The stencil really add charm. I am sure it will sell right away. Thanks so much, Jolinda! 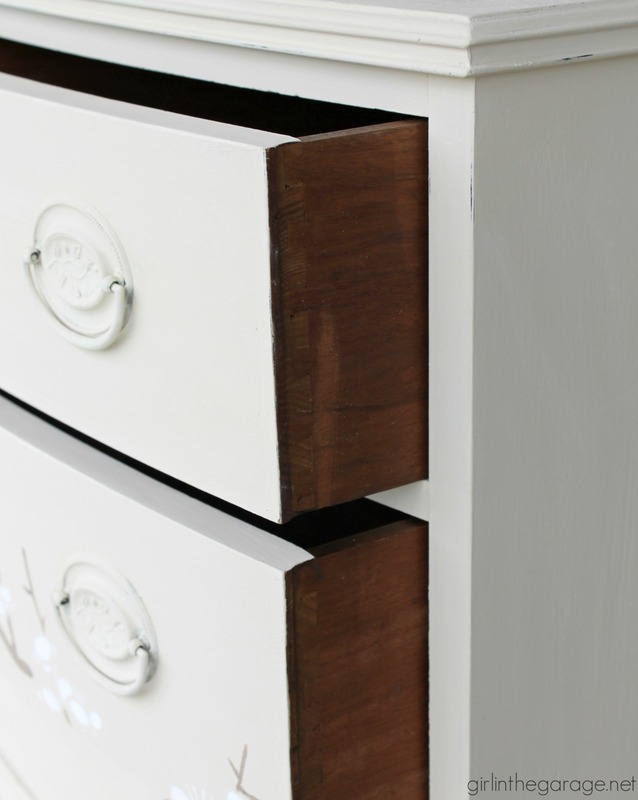 I’m glad I kept the original handles- they really do look perfect with the dresser. I love love love your dresser, It is so soft and beautiful, not busy at all. I’m sure it will sell quickly. Thanks so much, Barbara! 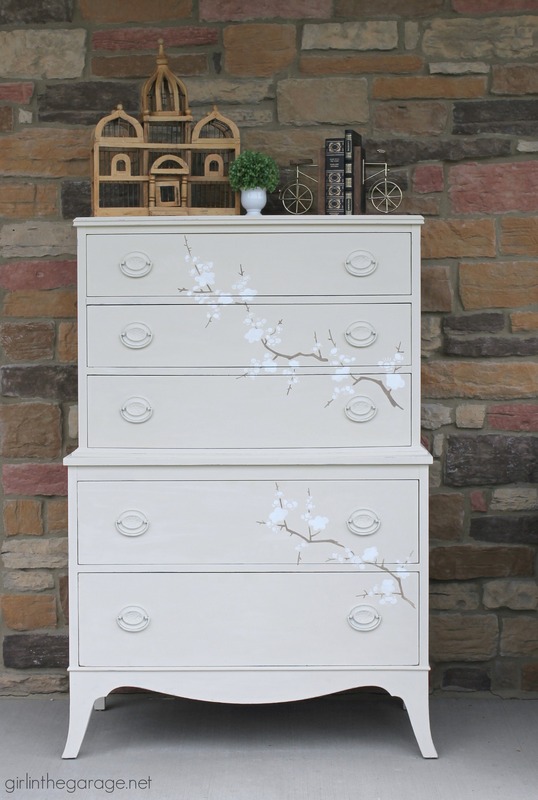 I did debate adding another branch or two, but I really thought “less is more” with this dresser. I’m so happy that you like it! 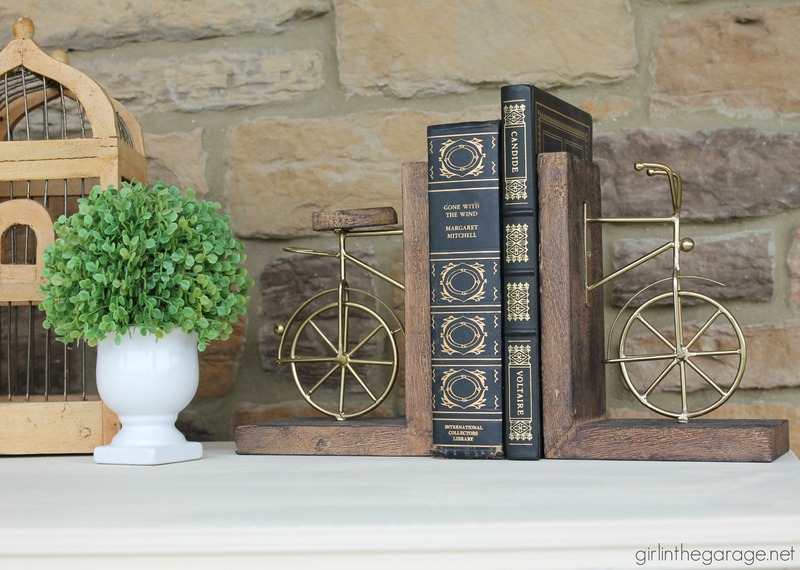 Christy@ Confessions of a Serial Do-it-Yourselfer recently posted…Turn $5 in Thrift Store Parts into Functional Décor! My daughter has the same dresser in white as well. It’s one of my favorites, I think I would scream if she left her curling iron on top! As always, great makeover! This is a great piece and great painting! Love the stencil, Jen. Wonderful job! I love that you chose to do a subtle colors on the stenciling. It makes it look so elegant. 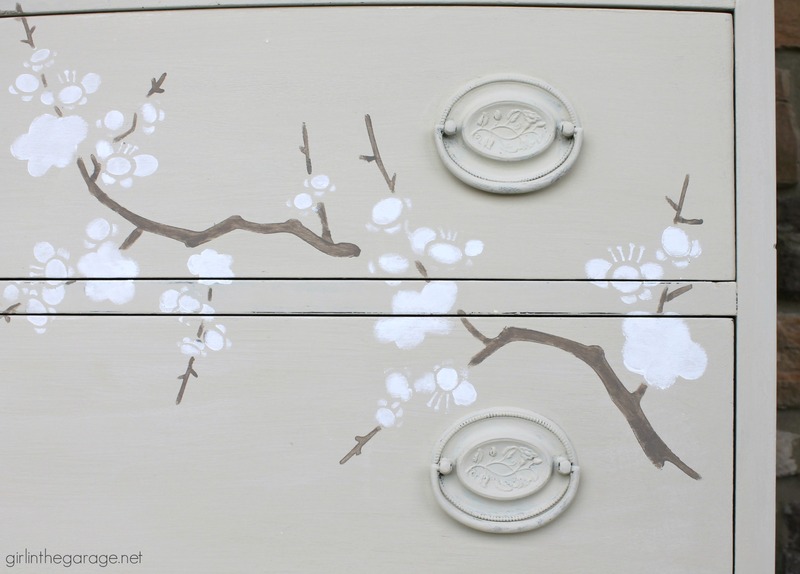 Love that dresser and your stencil choice are perfect. I’m sure it will sell fast, although if it were mine I’d have a hard time letting it go! It’s beautiful!! 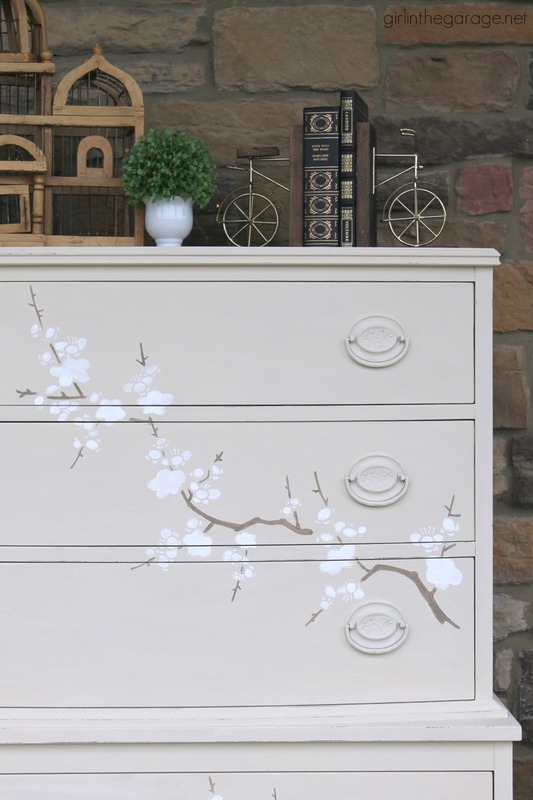 My favorite type of piece too 🙂 I’ve done some free-hand cherry blossom painting, but I love how this turned out too with the stencil and multi-color look. Fantastic, pinning! The entire VintageStyleLiving.com team loves your site! 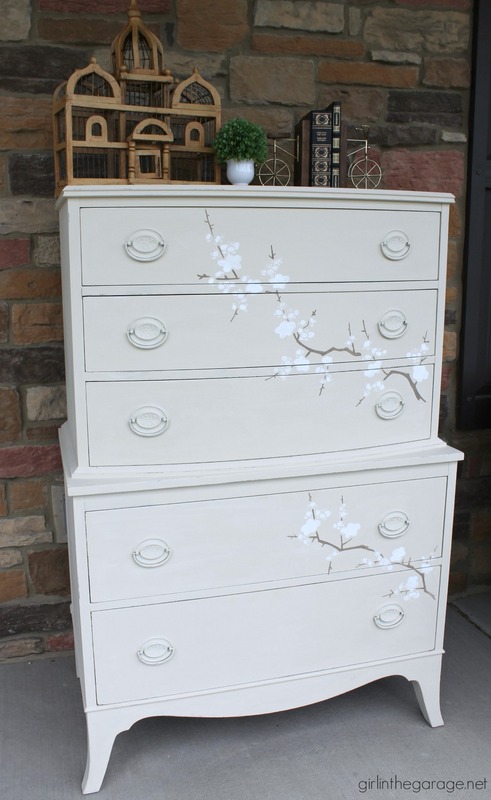 You have some of the best furniture makeovers we have ever seen! Truly inspirational and thanks for sharing!! !